We got some of the answers yesterday with presentations from Amsterdam’s bicycle coordinator and a representative of an NGO whose mission is to help other countries adapt the Netherland’s learnings to their own situations. So where did they start? 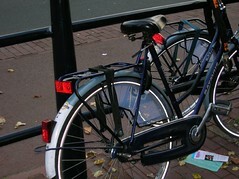 In 1950, following WWII, the Netherlands had 3.5 million bikes and 90,000 cars. As cars began to proliferate, there was an attitude that “the bikes are in the way of the cars” and an effort began to construct some 1,400 kilometers (km) of segregated bike paths. At that time, most home-to-work trips were within cycling distance. During the period from 1950-1975, auto trips expanded from 4.5 billion annually to 89 billion, while cycling stayed about level. However, while km cycled stayed level, fatalities while cycling tripled as auto-bike conflicts increased, in part where segregated bike paths crossed roads. In the 70’s, the Dutch had a sort of awakening, driven by the oil crisis, rising environmental awareness and predictions of the costs of building roads to accommodate rising auto use. From 1975-1985 km cycled went from 9.5 billion annually to 12.5 billion, driven by the build out of the segregated paths, addition of bike parking in city centers and rail stations and limitations imposed on auto parking in major cities. The Dutch began to think that perhaps the cars were in the way of the bikes! 1) The national government provided 80% subsidy on bike facility capital projects. 2) Bicycle coordinators were appointed in each city and formed a network, eventually producing a handbook standardizing bike facility design. In the 90’s the approach evolved again. With the recognition that intersections between segregated bike paths and and roads were a major source of conflict and safety, a movement to integrate bikes back into roadways began, resulting in the urban fabric we see today with bike facilities on almost every street. The learning has been that as drivers become aware of bikes, safety increases. As km cycled increased, overall accidents go DOWN. We are seeing an echo of this in Portland where as bike miles go up, accidents have stayed relatively constant. Indeed watching a street operate here in Amsterdam is a bit like watching a ballet – all the dancers, cars and bikes, know they roles and weave together very skillfully and very safely, despite very close proximity. I almost wonder if someday they will reach the point of cultural integration of cars, trams (streetcars) and bikes where physical delineations will no longer be necessary and they will operate seamlessly on a web of nothing more than social understandings. One of the Dutch innovations talked about much in America is the Woonerf, an extremely “traffic calmed” street that favors bikes and peds. I was very surprised to hear one of our hosts say they they are no longer constructed. The Woonerf was a phase, a way of raising consciousness of the interaction between peds, bikes and cars. Once the awareness had been created, the physical tools were no longer needed! So how can we apply these lessons in Portland? We don’t start from the same base of cycling that the Dutch did, but we have made some of the same decisions (e.g., to not build the Mt. Hood freeway and invest in transit instead). What are the transformations of awareness that we need to create to move Portland (without a lot of support from the national government) to the next level of cultural integration of our modes? What physical infrastructure can help lead to these mental changes? We spent yesterday getting a series of presentations on the development of the bicycle networks in Amsterdam and the Netherlands (40% bike mode split in Amsterdam, 27% nationally!). While I compose a longer post on the topic, here’s a little teaser. What is the purpose of the clear plastic panel that extends from the fender on this bike? The Portland delegation is trickling into Amsterdam, with most of the group at an arrival dinner tonight, and the rest arriving tomorrow. Here’s a typical streetcar street in a shopping district. There are other configurations on different street types that I’ll try to get examples of later in the week. Note that the purpose of this street is much more about access to the local uses than it is to moving people between parts of the city. It might be comparable to say 11th Ave in the Pearl District. 1) Streetcars operate in one direction and only have doors on one side. 2) Streetcars have up to five articulated sections compared to three in Portland. 3) Streetcars have a conductor who sells tickets. 4) There is a single track for travel in both directions, except at stops where it splits to two tracks. 5) Streetcars, autos and bikes (carefully) share the center of the street. Pedestrians rule most of the street and rather freely invade the center travel lane. We start our meetings with local experts tomorrow and I’ll be sharing the learnings here. Just getting ready to leave Prague for Amsterdam, and wanted share these photos or repair work on the cobbled sidewalks. The willingness to dedicate labor costs – it’s all hand work – to the public realm is very impressive.